With the long-awaited new Star Wars film The Force Awakens being released next month, hopes are high that there could be improvements in Star Wars’ depiction of women. 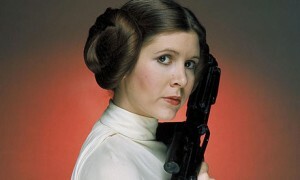 The Star Wars franchise has had issues with its lack of representation, however the portrayal of Leia Organa (most famously by Carrie Fisher) as rebellious and quick-witted has been positive. A recent interview with director and co-writer J.J. Abrams suggests that the franchise could be heading in the right direction, with Leia now referred to as ‘General’ rather than ‘Princess’. It cannot be ignored, however, that the Star Wars franchise has had a distinct lack of diverse representation of women. In the original trilogy of films, Leia is the singular significant female character. The only two other women in these three films with names and dialogue are Luke’s Aunt Beru, and Mon Mothma, a Rebel Alliance representative giving instructions in Return of the Jedi. Yes, that’s it for three whole films. Clearly, none of the original trilogy films passed the Bechdel test. Noah Berlatsky of The Atlantic theorises that this missing representation is linked to the genre and audience’s lack of interest in women more generally. Combining adventure and sci-fi, two stereotypically ‘male’ genres, Star Wars clearly focuses on the male perspective of characters Luke Skywalker and Han Solo. Berlatsky points out, after all, that it is Leia who is chained up near-naked, and not Han, satisfying male heterosexual fantasy through the male gaze. However, Star Wars does have a huge female fan base, and scores of women have discussed their experiences as high school geeks inspired by Leia Organa and the Star Wars universe, and it’s simply not good enough. The aforementioned storyline in Return of the Jedi – in which Leia becomes a slave in a metal bikini to Jabba the Hutt – is possibly the most contentious moment of the franchise. The controversy wasn’t helped by the fact that, for a number of years, ‘Slave Leia’ was the only female figurine that you could purchase from the franchise. However, some female fans have interpreted the scene in a more positive light, one in which Leia refuses to have her dignity taken from her. She is ultimately required to save herself from her enslaver, as her would-be male rescuers are fighting elsewhere. This empowered view has Leia quite literally strangling Jabba with the chains of patriarchy, thereby turning the damsel in distress trope on its head. For some, this interpretation redeems the objectification of the character and actress Carrie Fisher – but still, a metal bikini? Was it really that necessary? While there are issues with Leia’s representation, her fighting spirit and defiance was a positive presence onscreen, particularly in the first film A New Hope. In his thesis The Power and the Force: Race, Gender, and Colonialism in the Star Wars Universe, John Paul Pianka argues that, as director and creator George Lucas had little idea of the commercial success that the film would garner, Leia in this film is sharper and more independent than other film heroines of the period. In fact, she shoots more Stormtroopers in this film than the entire male cast combined. The audience is introduced to Leia as a Senator from Alderaan, wearing a white gown and her signature earmuff hairstyle. She is an un-sexualised authority figure, and a rebellious one at that. She is always ready with a sarcastic comment and undaunted by ordering her male counterparts around. She issues instructions to the all-male Rebel pilots in the battles in the first two films, and her presence as a woman with authority is never presented as extraordinary. However, the runaway success of A New Hope led to the production of The Empire Strikes Back, which would be released three years later in 1980. Perhaps due to the desires of the mainstream audience or the studio bosses, there is a significant shift in Leia’s characterisation. Sure, she is still badass, issuing orders and saving the day, yet a large portion of her narrative arc is now devoted to her fiery, will-they-won’t-they relationship with Han Solo, who is convinced that she has a crush on him. Known for her acerbic wit, Carrie Fisher recently advised young actress Daisy Ridley, who plays the lead role in The Force Awakens: ‘I’m looking forward to your space kiss. You’re going to have to have one. Every girl does.’ That remains to be seen, but you have to admit that it would be nice not to have the strong woman of the film be forced into a romantic plot. For the benefits of space, as well as the fact that some Star Wars fans have disowned the widely panned prequel trilogy of the late 1990s and early 2000s, I won’t extensively discuss the issues with Padme Amidala, as portrayed by Natalie Portman. However, any hope of a more nuanced representation of women, especially considering the advancements of feminism since the late 1970s, were to be disappointed. Although Padme is presented in the films as a good negotiator, her primary role is as the wife of Anakin Skywalker. And in Revenge of the Sith, when Anakin crosses to the dark side, she dies after giving birth to Luke and Leia because she has ‘lost the will to live’. Uuuuugh. That’s exactly what we don’t need. Recent Walmart commercials advertising Star Wars merchandise as the connection between parents and children perfectly depict the ideal gender representation that we’d like to see in The Force Awakens. In one advertisement, a father in the 1970s gives a Star Wars figurine to his son, who grows up to give his daughter a similar gift in 2015. In another, a mother asks her young daughter why Leia didn’t just let Han and Luke rescue her from the Death Star. She instantly replies that it is because Leia is ‘a modern empowered woman unfettered by the antiquated gender roles of a bygone era’. Although corporations clearly wouldn’t have the purest of intentions as their goal is to sell merchandise, it certainly engenders the notion of acceptance and diversity that the Star Wars universe should be presenting. So, on our Christmas wish list, there are hopes that The Force Awakens will retain the wit and defiance of Leia Organa, while expanding its number of women and their characterisation to represent the diversity of its fan base. Let’s hope it happens. Really enjoyable reading! Danielle Croci is right: The Force Awakens definitely needs to include more female characters with multiple roles. If only they could have normal body shapes too! Sick of these stick thin, perfectly groomed types! This entry was posted in Feminism, Film, Opinion and tagged film, general leia, leia, princess leia, sci-fi, sci-fi film, star wars. Bookmark the permalink.